This multifaceted and multiyear initiative honors and advances the remarkable legacy of women who attended Hollins. It serves and supports our current students and also launches them into a lifetime of active engagement with their alma mater. It will help us attract increased numbers of qualified women who want to pursue a Hollins education and join the Hollins network. We invite all alumnae, and all who love Hollins, to join us. The Hollins Ambassadors Circle is a volunteer recognition society created to honor the extraordinary and exemplary commitment of time and talent given by alumnae/i, parents, and friends to support the Alumnae Engagement Initiative: enrollment, career, alumnae to alumnae, and philanthropy. We are grateful to all of our alumnae, parents, and friends who give of their time and talent to Hollins. See the list of members for 2015-16 here (PDF). Those who share their time and energy with Hollins make this a better place for everyone. 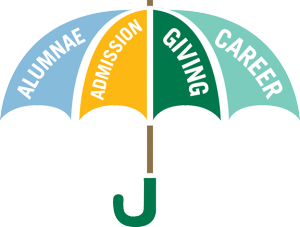 From working with your classmates on Reunion, to working with alumnae in your local area to host events, to taking the time to mentor a current student, to raising sights for philanthropy, there are many ways to be involved in the life of Hollins.